The new Stable-tip electrode holders eliminate the final instability link in the electrophysiology experimental setup. We’ve taken a thermally stable base material and coated it with aluminaoxide. This coating has two benefits: first, it is non-conductive so the holder does not act as an electrical antenna; second, it is very resistant to corrosion. Under conditions of a high resistance electrode seal (gigaseal), the ST series electrode holder has a noise level of 0.79–0.80 pA RMS (5kHz filter); polycarbonate measured 0.78–0.79 pA (reported using an Axopatch 200B in whole-cell mode). The base material of the Stable-tip has a thermal expansion coefficient of 23μm/m°C versus 70μm/m°C of a polycarbonate holder. That is an improvement by a factor of three. 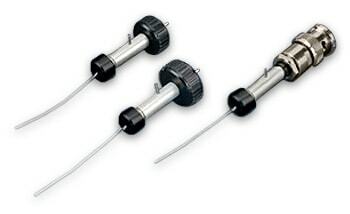 The Stable-tip electrode holders come with one (1) each of Ag-wires and wire seals. NOTE: Pipette seals are not required for the latest model ST-50. When ordering, specify the headstage amplifier. If ordering for a Axon CV-4 the major diameter of the mounting feature is needed.